Meryl Streep, 1975. Gelatin silver print with hand applied text. Yves Saint Laurent, 1983. Gelatin silver print with hand applied text. 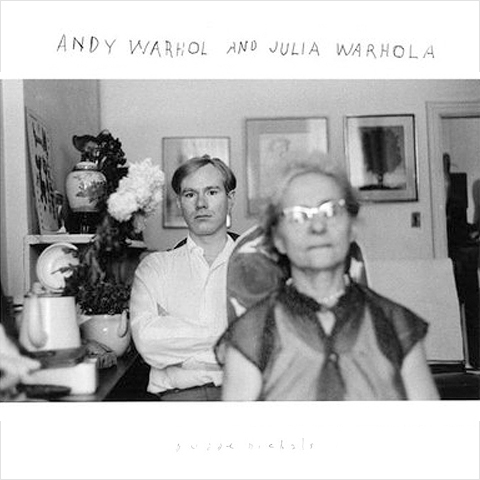 Andy Warhol and his Mother Julia Warhola, 1958. Gelatin silver print with hand applied text. I visited the Snap! Orlando space and their latest exhibition of Duane Michals: The Portraitist. If you haven’t yet visited Snap! it’s an experience you shouldn’t miss. The current show was curated by Linda Benedict-Jones, former Curator of Photography at the Carnegie Museums of Pittsburgh and current Adjunct Professor at Carnegie Mellon University teaching the History of Photography. This collection is the first comprehensive overview of unique portraits by this influential photographer. Michals describes himself as “self-taught” and worked for many years as a commercial photographer for Esquire, Mademoiselle, and Vogue. His style differed from that of his counterparts in that he did not shoot photos in a studio, but rather on location with the subject. Michals photographed numerous artists and public figures, from Grace Coddington to Yayoi Kusama, Rene Magritte, Andy Warhol, Madonna, Burt Reynolds, and the original cast of Saturday Night Live just to name a few. The list goes on and on. They are all shown together in this stellar exhibition. Michals used two unique innovations in his photographic work. First by implementing a storytelling approach and sequencing photos to take the viewer through a narrative, and second he incorporated writing on or near the photograph to provide additional context that isn’t always conveyed in the photo at the moment. The photos are displayed in groups of artists, writers, photographers, actors, directors, fashion, self-portraits, and intimate stories. You only have until April 6th to visit this exhibition before it travels to New York. Watch the Townie Tourist sneak peek of Snap! Orlando below.